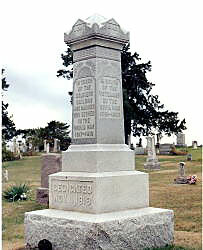 Description: The capital of the monument is engraved on all four sides: "Red ~ Cross", Navy ~ U.S.M.C." "Army", "G.A.R." The main spire is engraved on all four sides: "In Honor ~ Of The ~ Veterans ~ Of The ~ Civil War ~ 1861-1865", "In Honor ~ Of The ~ Veterans ~ Of The ~ Spanish- ~ American War ~ 1898", "In Honor ~ Of The ~ Soldiers ~ Sailors ~ And Marines ~ Who Served ~ In The ~ World War ~ 1917-1918", and "In Honor ~ Of The ~ Loyal Women ~ Of This ~ Community"
The base is engraved: "Dedicated ~ Nov. 11, 1919"
Description: This granite monument is engraved: "They died that others might live free ~ In memory of our Civil War Soldiers who rest here - Each Duty Done ~ Rest In Peace." 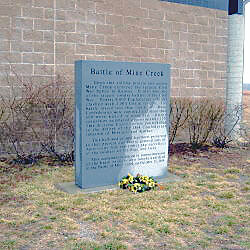 Description: A granite monument is inscribed: "Battle of Mine Creek ~ Upon this rolling prairie and across Mine Creek occurred the largest Civil ~ War battle in Kansas. It also was one ~ of the largest cavalry battles of the Civil ~ War. Nearly 8,000 Confederate soldiers ~ clashed with 2,500 Union troops. The ~ battle lasted less than one hour. Many ~ Confederates were captured and more than ~ 600 were killed or wounded. Union ~ casualties numbered approximately 120. ~ This decisive Union victory contributed ~ to the defeat of the 1864 Confederate ~ invasion of Missouri and Kansas." "This hallowed ground has been preserved ~ so that present and future generations of ~ Americans may remember the sacrifices ~ of the soldiers of the Blue and Gray." 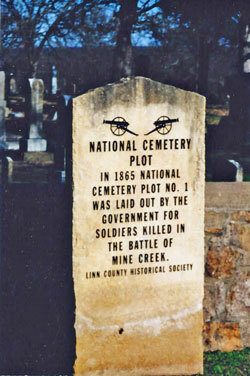 "This monument is placed in commemoration~ of the brave soldiers who fought and died ~ in the Battle of Mine Creek on October 25, 1864." 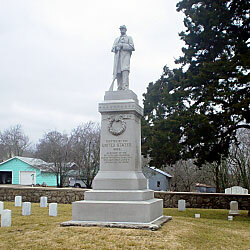 Description: There is an 18' monument, including a figure of a private soldier standing with "arms at rest", in the GAR section of the cemetery. 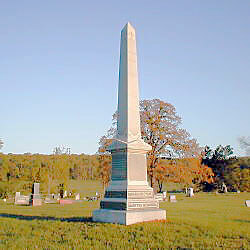 The front of the supporting column is engraved: "Erected By The ~ United States ~ 1889. 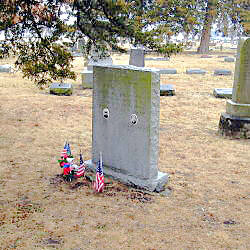 ~ In Memory Of The ~ Officers And Soldiers, ~ Buried Within This Cemetery, ~ Who Gave Their Lives In ~ Defence Of The Union". Description: A granite monument is inscribed: "They Sought No Glory ~ But Their Country's Good ~ In Memory Of Those ~ Who Made The Supreme Sacrifice In Defense ~ Of Their Country ~ We Honor All" "Sponsored By The ~ U.S. Army Mothers V.F.W. ~ And American Legion Of ~ Pleasanton ~ 1948". The back side is engraved: "Dedicated To All ~ Men And Women ~ Who Served Their ~ Country In War ~ And Peace." 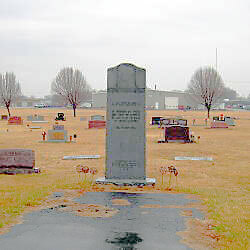 Description: A granite monument is inscribed : "Greater Love Has No Man Than This ~ That A Man Lay Down His Ife For ~ His Friends ~ Dedicated With Love And Honor ~ To The Men Who Served In The ~ Armed Forces And Paid The Supreme ~ Sacrifice In The Cause Of Humanity". Below this inscription are the pictures of Cpl John L. Davis and CN Patterson, both marked Vietnam 1967. "On The 19th Day Of May, 1858, The Men Whose ~ Names Appear On This Monument Were Taken ~ From Their Daily Avocations By A Band Of ~ Armed Border Ruffians And Marched To A ~ Deep Ravine Four Miles East From This ~ Place And There Shot And Left For Dead. ~ Their Only Offense Was ~ They Were Free State Men". "Rev. B.L. Read ~ John F. Campbell ~ William Colpetzer ~ Michael Robertson ~ Patrick Ross ~ William Hairgrove ~ Asa Hairgrove ~ Charles Snider ~ William A. Stilwell ~ Amos Hall ~ Austin Hall". 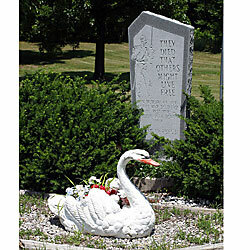 "From The Hearths Of Their Cabins, ~ The Fields Of Their Corn, ~ Unwarned And Unweaponed, ~ The Victims Were Torn, ~ By The Whirlwind Of Murder ~ Swooped Up And Swept On ~ To The Low Reedy Fen-Lands, ~ The Marsh Of The Swan ~~ On The Lintels Of Kansas ~ That Blood Shall Not Dry; ~ Henceforth The Bad Angel ~ Shall Harmless Go By; ~ Henceforth To The Sunset, ~ Unchecked On Her Way, ~ Shall Liberty Follow ~ The March Of The Day". "(Ad Astra Per Astra ~ Erected 1888)".